The 2016 Toyota Tundra is a capable full-size pickup that’s truly earnest about off-road operations. It features robust V8 powertrains, a large double cab with rear doors, and user-friendly technology. For 2016, all Tundra trucks receive an upgraded electronics interface, and the upper trim levels get a bigger gas tank and a standard assimilated trailer brake control. The Tundra SR5 and 1794 Edition trims also receive slightly revised front end styling. Also, 1794 can now be outfitted with the TRD Off-Road bundle. Check out the new Tundra at your friendly Lakeland Toyota dealership located in Central Florida and serving our nearby Brandon and Plant City neighbors. 2016 Toyota Tundra features two wheelbases and three-bed lengths. Choices also include three cab styles: regular cab, extended double cab and CrewMax crew cab. CrewMax models and Double Cabs seat five or six passengers, depending on whether you opt for a front bench. The regular cab seats three. There are six Tundra trim levels for you to select from: the Tundra SR, the Tundra SR5, the Limited, the Platinum, the Tundra 1794 Edition and the Tundra TRD Pro. The availability of certain options or packages can vary based on the region where you live. The SR Work Truck package removes the power locks and windows and replaces the cloth upholstery and carpet with vinyl. 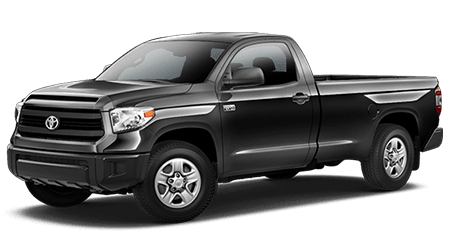 If you choose the Tundra SR5 (double cab and CrewMax only), you’ll get an upgraded, 7-inch touchscreen, satellite radio, HD radio, traffic information, navigation, fog lights, chrome exterior chrome trim, and variable intermittent windshield wipers. The CrewMax includes a power opening rear window and an overhead console. The SR5 Upgrade Package adds front bucket seats that include a power height-adjustable driver seat and lumbar adjustment, a tilt-and-telescoping steering wheel, an auto-dimming rearview mirror, a center console (with storage and "floor" shifter), and a larger gas tank with the 5.7-liter V8 engine. To that system, the Safety & Convenience package enhances with a blind-spot warning system and rear cross-traffic alert along with front and rear parking sensors. Eighteen-inch alloy wheels can be included as an option. The Tundra TRD Pro includes the SR5 Upgrade components plus unique styling elements, off-road tires, black 18-inch alloy wheels, an off-road suspension, an eight-way power driver seat, four movable bed tie-down cleats. a four-way power passenger seat, an upgraded 7-inch touchscreen (optional on SR5), leather upholstery and red stitching, a navigation system and additional speakers (seven in the double cab, nine for the CrewMax). The Limited (Double and CrewMax only) enhances the base and Upgrade SR5 equipment with automatic headlights, the tie-down cleats, 20-inch alloy wheels, a four-way power passenger seat, an eight-way power driver seat, and automatic dual-zone climate control. It also includes leather upholstery, a leather-wrapped steering wheel, an upgraded 7-inch touchscreen, a power-sliding horizontal rear window (double cab), a navigation system, and additional speakers (seven in the double cab, nine for the CrewMax). The Limited Premium Package includes the Safety & Convenience components plus anti-theft alarm features and extra interior lighting. A sunroof is possible on the CrewMax. The Safety and Convenience package comes with the top-of-the-line Platinum level. (CrewMax only.) It then adds onto the Limited's equipment with power-folding and auto-dimming mirrors, LED running lights, a sunroof, 20-inch wheels and styling elements, ventilated and heated power front seats, a 12-speaker sound system (an optional feature on the Limited CrewMax), and driver memory functions. The 1794 Edition differs from the Platinum with regards to its distinctive exterior and interior styling elements. The TRD Off-Road package is an option for the SR5, Tundra Limited, as well as Tundra 1794 Edition. It features 18-inch TRD wheels, off-road tires, trail-tuned shock absorbers, skid plates and tow hooks. Stand-alone options on most trim levels include heated tow mirrors and running boards. The 2016 Toyota Tundra arrives standard with the 4.6-liter i-Force V8 engine that generates 310 horsepower and 327 pounds-feet of torque. The highly popular Tundra engine -- and one of the ablest and sophisticated in the full-size pickup segment -- is the accessible 5.7-liter i-Force V8. It’s a refined mainstay that harnesses 381 horsepower and 401 pounds-torque of torque. For 2016, some of those with the 5.7-liter V8 are verified Flex-Fuel Vehicles that can consume up to E85 blend fuel (available in select areas). The EPA-estimated fuel economy for the 2016 Tundra two-wheel drive is 16 miles-per-gallon combined (15 miles-per-gallon in the city, 19 miles-per-gallon on the highway). The Tundra four-wheel-drive versions also rate 16 miles-per-gallon combined (14 miles-per-gallon in the city, 18 miles-per-gallon on the highway). Maximum towing ability with the 4.6-liter is between 6,400 and 6,800 pounds contingent on body style. The Toyota Tundra family of full-size pickups offer stature, power, and model choice, with 50 total configurations available. Test drive a 2016 Tundra today at Lakeland Toyota where we also serve Brandon and Plant City, FL. We’ve got lots of Tundra trucks to choose from right here in Lakeland, FL!